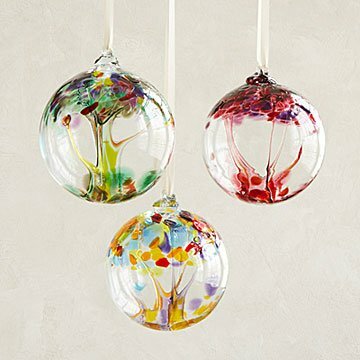 Stephen Kitras' vibrant, handmade, recycled glass globes depict trees of Remembrance, Peace, Joy, and Love. Beauty, elegance and heartfelt sentiment are at the root of artist Stephen Kitras latest collection of glass globes. Hand blown of 100% recycled glass, this series features Kitras' signature ability to create a delicate interior trunk within the globe. Vibrant splashes of color add the finishing touch on these one-of-a-kind home accents. Use your own sturdy wire, translucent fishing wire, or ribbon to hang the globe from the display stand or elsewhere. Handmade in Canada. Just as tree undergoes changes as it grows from a seedling to maturity, our lives are full of unique and important people and moments that define us as individuals. The Tree of Remembrance encourages us to treasure each of life's moments and cherish the memory of people and places that are near and dear to us - the children, the friends, the parents and the occasions that create the mosaic of our lives. The beauty and tranquility of nature in essence captures the meaning of peace. Like a tree growing in harmony with the forest that surrounds it, peace brings with it a message of tolerance, acceptance and compassion. There is no greater gift in the world than the gift love. Like a tree, love grows stronger and more beautiful with time. The Tree of Love represents the countless blessings the love brings into our lives. When you realize that your fulfillment in life comes from all that surrounds you, you've reached a true state of happiness. When we look at a tree full of life swaying in the wind to the rhythm of life, we are reminded of the pure bliss that is happiness.